The number of home repossessions in the US soared in July, figures suggest, underlining the woes facing the sector. There was a 93% jump in filings for repossessions on the same month a year ago, and a 9% rise on June's figure, property firm RealtyTrac said. The figures will make worrying reading for many analysts as problems in the US mortgage market have triggered a global credit crunch and drop in share prices. Other data showed higher job losses in the construction and property sectors. Falling sales and decreasing prices have made it harder for homeowners who have hit difficulties to sell their homes and clear their debts. The RealtyTrac data showed there were 179,599 foreclosure - or repossession - filings in July. This equates to one for every 693 households. California, Florida, Ohio, Michigan and Georgia accounted for more than half of the cases. Borrowers with sub-prime loans have been particularly hard hit. The US sub-prime mortgage sector offers higher-risk loans to people with a poor credit history. As US interest rates have risen and the housing bubble has burst, a growing number of sub-prime borrowers have defaulted on their loans. Because the lenders have often sold on the debt, this has led to extensive financial difficulties for a number of investment funds with heavy exposure to the sector - prompting fears of a wider financial crisis. Analysts say that the biggest worries for investors is not knowing the eventual scale of the problem. Many sub-prime loans were given to borrowers who did not furnish paperwork proving their income. Leading lenders such as Countrywide have said they are now tightening their lending standards as well as making staff redundant. Data from consulting firm Challenger, Gray & Christmas said the housing industry had announced 87,962 job cuts so far this year - 75% more than recorded for all of 2006, with 41% linked to housing market troubles. Nearly a quarter of the year's cuts had been announced in August alone, it said. 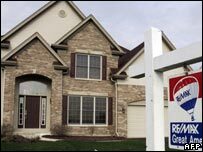 "Many companies expected the mortgage situation to implode. They've just been wondering when the bubble would burst," said chief executive John Challenger. "Companies are not surprised by what's happening, but the reality of the situation and the speed with which it occurred is shocking."